Sheffield had its very own web conference in the form of Speak the Web and I had to go, due to the scarcity of such things in this town. Frustrating considering how many creative agencies there are round here. We’ve had TEDx North, which was great, but what I really wanted was something tailored for hungry designers and developers. It was held at the Showroom Cinema in town and the creators said that they wanted something akin to the atmosphere of a gig. Hence the £20 entrance fee. Although the only gig I’ve been to that cost more than 20 quid was Radiohead. But they didn’t give you a free drink. Two chaps from Cahoona told us how they set up their agency, so of course there were the usual tales about living off pot noodles and worrying about the cash-flow. Their scotch-egg (sorry, Manchester-egg) heavy presentation was pretty well done and amusing. 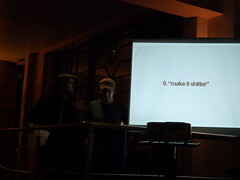 They had one legendary slide: “Make it shitter”. I think it was a reference to the problem that is often faced due to client-meddling. I guess their success shows that they deal with this meddling well, by caving into the request of the client, no matter how awful. I’m not 100% sure that’s how I’d run a web agency, but I understand their reasoning and hey… I’m probably never going to run a web agency. I dig their work though, especially their company website. Bruce Lawson was the man from Opera. I’ve tried to use Opera on the Desktop and I always go back to Firefox (or Chrome), but he wasn’t here to pimp Opera. He was here to pimp HTML5, which Opera (especially Opera 10.5) supports pretty well. I’ve read quite a bit about HTML5 (including a lot at html5doctor, where Bruce writes) and the whole thing is quite exciting, but Bruce made it sound more realistic than I had previously imagined it was. My attitude has been that it is ‘for the future’, but now my attitude is that HTML5 is for now. The usual HTML5 video tricks were demonstrated, along with some stuff I didn’t know about, such as a totally different way that one can structure headings (Two H1s on a page? You have blown my mind!). Bruce wasn’t some crazy futurist though and he told us how, for example, we could get SVG-based graphics working in IE using VML. He didn’t go into too much detail (it wasn’t the time or the place for that) but he caused plenty of little sparks to fire in my brain. Finally it was the turn of Brendan Dawes from magneticNorth. He was a great contrast to Bruce: all about the “Cushions”, the flash, fluff and visual niceties that make a website a website, rather than just a flat image. The best example he showed us of this, I think, was the shopping cart that smiled as you added products to it. A simple effect, but one that I can imagine makes a user happy. We were all children once and to bring that playful aspect into web design has got to have benefits. Although he may have sounded at odds with Bruce, the reality is that due to HTML5, CSS3 and some powerful js libraries, it is now possible for a good developer to make pages that are full of ‘Cushions’ but which are accessible and thus keep Bruce (and disabled people) happy. I hope they talked to each other after the event. Brendan also pointed out that there weren’t many girls at this event and that it was a bit like a “gay club”. Firstly, a load of dudes in one place doesn’t constitute a gay club. If it did, then the Tory front-benches would be, well… less said about that the better. Secondly, we’re all well aware of the lack of women in technology. It needs sorting, but I think sometimes joking about the lack of women in tech isn’t terribly helpful. So, in summary: this event was brilliant and all the speakers were interesting. I’m inclined more now to go to one of the local GeekUp events, which I think the people who arranged this conference are also involved with. To use the hosts analogy of a gig: it wasn’t as good as Radiohead, but it was a lot more interesting than that time I saw a side project by one of the guys out of Busted. Shudder. The Speak the Web peeps have put up a better round-up on their page. I’m off to the event they’re running in Leeds tonight. Everyone with a ZX Spectrum had Horace Goes Skiing. That’s fact, surely? I did. The protagonist, Horace, was in a number of games and should be instantly recognizable to those who spent far too much of their childhoods loading games from tape. For a while now he’s been springing up round Sheffield. I’m going to leave any argument about the rights and wrongs of graffiti aside (primarily because it’s boring) but he tends to pop up in easy to see, yet hard to access places. I snapped him here, behind the famous Roneys butchers. The locals have already discussed his presence here, on the much-used Sheffield Forum. I’ll be keeping an eye out for more occurrences. My colleague and play-pal, Andy, left for Japan (aka weeaboo land) this month and as a treat we at rckt took him for a Japanese meal. y’know? Just to test the authenticity of the whole thing! I was put off initially, because I hate raw fish but it turns out that both the Japanese and the restaurants that claim Japanese culinary skills are all over that. It’s all about the steak now! 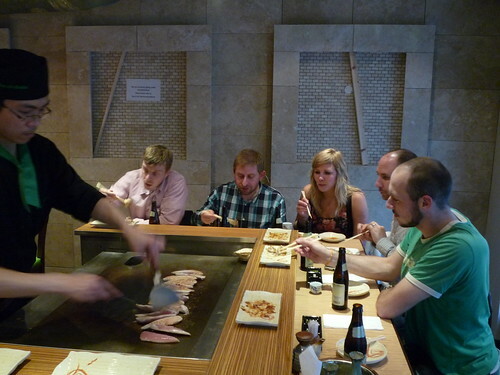 So we went to Wasabisabi on London Rd, Sheffield for a meal. It was not only a novelty (the food is cooked in-front of you) but also it was very delicious. Recommended. I’ve just been sitting here and the whole house shook for about 4 seconds. So, being the geek I am: go internet go! 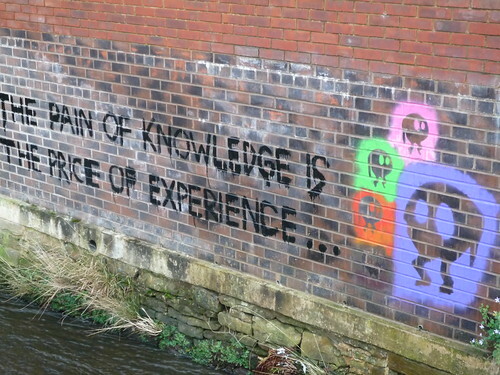 The ever-useful Sheffield Forum tells me that I wasn’t imagining it. Even more surprising is the news there that it was felt as far west as Manchester and that according to my friends who I’m talking to over IM, as far East as Hull. Wierd. They felt it strongly too. More news later, I guess. It’s always interesting to see how the big media (like the BBC) react to this sort of sudden unexpected news. Update: The BBC have got an initial report here. Got two pals in North London saying they felt substantial shakes. Update #2: One guy hurt his leg when his chimney fell on him. My Mums piggie bank nearly fell off the telly. That’s it. No doubt the Japanese/San Franciscans are looking on and sneering at us making such a fuss. Unsupprisingly, it was left to b3ta.com to make the defining point. Sometimes it feels nice to rant against blatant stupidity and get the support of my peers (read: fellow redditors). I’m happy to be upmodded when it’s something I care about. Sad? Well, maybe. But in this case; when it involves media-scaremongering that makes people terrified of their own neighbourhoods (specially when it’s my neighbourhood), I’ll happily take those votes. Was awoken up this morning by a police officer knocking on my door. He told me there had been “an incident” and wondering if I’d seen anything. As I wasn’t dressed and was rubbing the sleep out of my eyes, he figured pretty quickly I hadn’t. Only once I’d got myself sorted and ready to go to work did I discover that the road outside our house was cut off by blue police tape that I had to work my way through to get to work. I figure I was technically in a crime scene! Apparently a bank-van had been held up by armed men as it refilled a near-by cash machine. I don’t think anyone was hurt, but they made off with a hell-o-a-lotta cash. 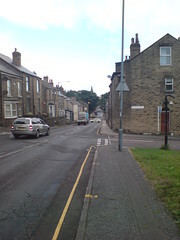 South Road in Sheffield does seem to be attracting an inordinate amount of police attention recently. I don’t know why, maybe because it’s close enough to the city centre to have targets of value, but far enough from the city centre to be free from CCTV etc. I’m only speculating here. I have absolutely no idea. The constant rain and subsequent flooding yesterday was pretty amazing. I’m lucky that I live and work on some of Sheffield’s higher ground, so I wasn’t personally effected. However at work we could watch the citys traffic cameras online. Roads either became blocked with traffic, closed off, flooded or in some cases blocked with abandoned cars and flooded. We saw industrial buildings to the North of the town catch fire and Sheffield Forgemasters (who coincidently, I’ve helped develop a website for) were pretty much submerged. I’m now quite familiar with Sheffield and it was eerie to watch recognisable places and structures suddenly acquire their own moats in real time. The local web forum was full of people posting pictures of their homes and offices partially submerged and their cars floating. The roads, bridges and the station is still a mess. For me, it was also interesting to see how locals made pretty much immediate use of web forums, imageshack pictures, blogs and youtube posts to spread their, sometimes quite scarey, stories.Â All in all, a case-in-point example of a so-called Media 2.0 ‘hard news’ day.